SEASONAL INGREDIENT STUDY NO.4: We've been quite bad, rather, I have been quite bad. A whole week without one post! Life caught up with me and I haven't had time to post; instead, I have been consuming the creations I intend on photographing and writing about. I assure you that this won't become a habit, but it is summertime so I can afford a lazy week. I haven't been that lazy. I did actually cook and bake rather than order pizza, which was the desire. I'm quite glad I didn't phone up Domino's for my hips cannot tell a lie. 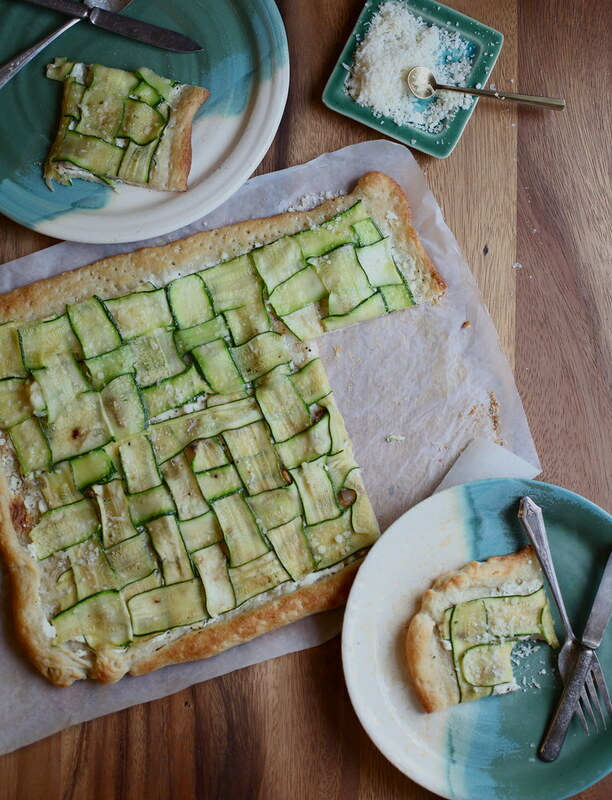 Plus, I wouldn't have this summertime zucchini and goat cheese pizza to share with you, which I have made twice now for my family. 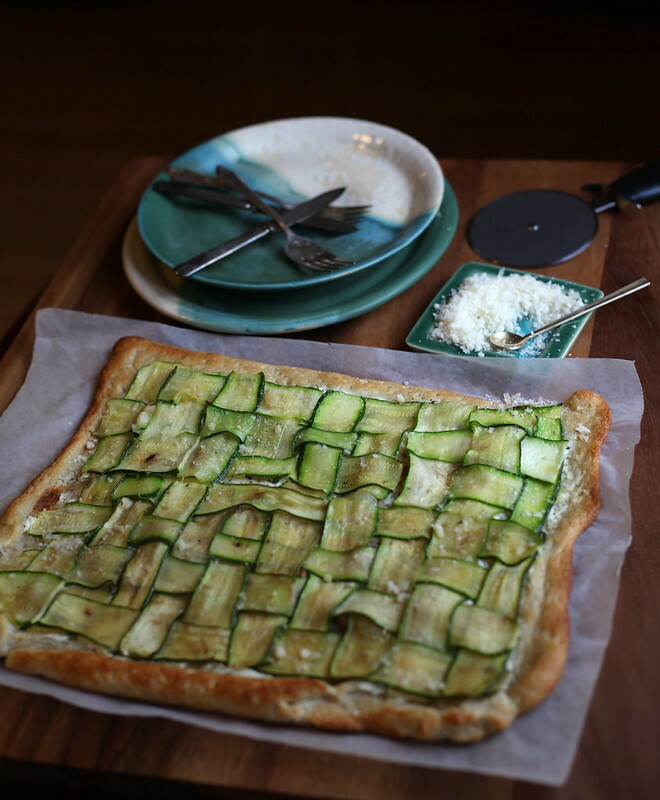 One was with a phyllo dough crust and another was with a no-knead pizza dough, which was my favorite – it is that good. In fact, I do believe I can take Domino's off my speed dial (in case you don't understand my humor or "wit" - they weren't on my speed dial). INGREDIENTS AND INSTRUCTION FOR DOUGH: this no-knead pizza dough recipe was found on The Vanilla Bean Blog. Use it – it is great and easy, but do plan ahead. Mix yeast and salt with the water in a large bowl. Then mix in the flour. Do not knead; instead, use a spoon or mixer with the paddle attachment. Cover the dough for approximately 2 hours. This allows the dough to rise and collapse. Refrigerate for another 2 hours. Preheat oven at 500 degrees. Chop the shallot. Saute the garlic cloves and shallots together in a pan with olive oil until golden brown. Add salt and pepper if desired. Cut baking paper and place on baking pan then sprinkle flour on top. Stretch an orange-sized amount of dough into pizza shape. Keep the rest of the dough in the frig because it can be used for up to 14 days. Mine was not close to the elegant circular shape the was on the Vanilla Bean Blog. But the irregular rectangle shape didn't upset anything other than my aesthetic. Pre-bake the pizza for 4 minutes. With pre-bake pizza dough spread a layer of goat cheese. Sprinkle in the garlic and shallots. Add salt and ground pepper if desired. 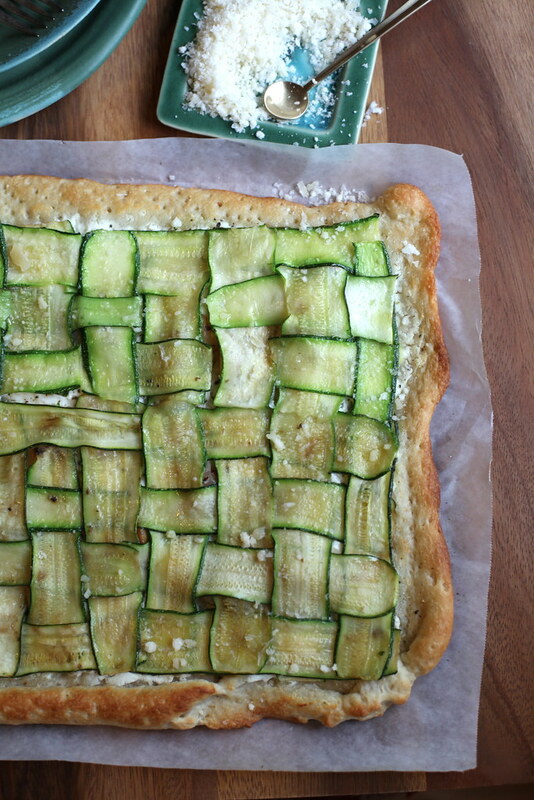 Weave the zucchini ribbons over the top of the cheese and garlic/shallot toppings. Place pizza back in over for 8-10 minutes at 500 degrees. Take pizza out when dough has reached a golden brown color. I wish I had taken more pictures to showcase the deliciousness of this pizza, but the stomach growls got the better of us.